European countries generally lacked the wealth and political support necessary to suppress faraway revolts; they also faced opposition from the new superpowers, the U.S. and the Soviet Union, both of which had taken positions against colonialism. Korea was freed in 1945 by Japan’s defeat in the war. The U.S. relinquished the Philippines in 1946. Britain left India in 1947, Palestine in 1948, and Egypt in 1956; it withdrew from Africa in the 1950s and ’60s, from various island protectorates in the 1970s and ’80s, and from Hong Kong in 1997. The French left Vietnam in 1954 and gave up its North African colonies by 1962. Portugal gave up its African colonies in the 1970s; Macau was returned to the Chinese in 1999. WWII devastated the British and French empires; they had no strength left for colonial rule. A desire for independence among the colonies after WWII. The formation of the United Nations and the emergence of the U.S. as a super power. The newly independent states brought a new sense of self-respect and personal and national dignity to people, high hopes of a better life and social change. These hopes soon dissolved in the face of mass poverty, unemployment, ethnic quarrelling, poor housing, disease and human rights violations. Corrupt regimes, military dictatorship and one-party rule added to the problems the new colonies faced. These problems were largely due to the fact that Colonialism had left the new nations unprepared. Their economies were based on producing raw materials using unskilled labour. They could not complete with the modern economies of the North but suddenly found themselves having to. 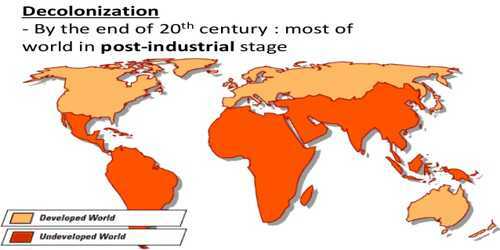 These new countries had to rely on previous empires and new powers, for financial assistance and technological advice. Decolonization gave way to a large migration of peoples to the former empires of France and Britain. More than 16 million people moved during the decolonization period that followed the Second World War. Mass migration resulted in complicated urban patterns, race riots and the enrichment of cultures. Decolonization is a central historical trend. Occurring in four broad phases from 1776 up to 1991, it has shaped the present-day global system of states through the release of revolutionary forces. The term “decolonization” refers to the process through which colonial rule dissolved, and it encompasses the various political, economic, cultural and social dimensions of this process both in the periphery and in the metropole. Decolonization is not new and we do not aspire to meet the academic demand for new and invigorating paradigms; it is not the academy we are interested in invigorating. Instead, we seek to ground decolonization in the lived experiences and histories of those individuals and communities that have and are living out decolonization, seeking to invigorate connections, struggles, and knowledge that reside beyond the academy.